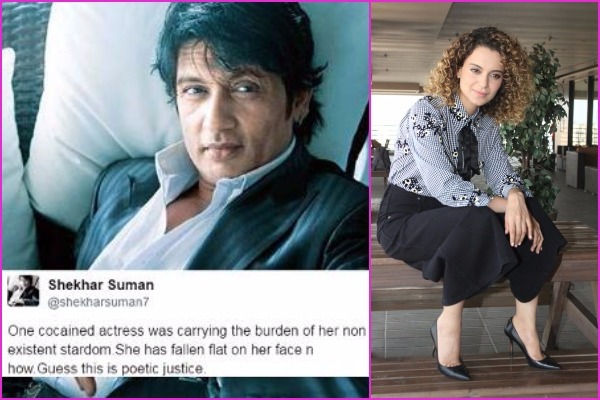 Shekhar Suman, who was once a very popular comedian and actor in Indian entertainment industry took a dig at Rangoon actress Kangana Ranaut. The old wounds Shekhar Suman had were never faded and it’s still as fresh as we can see in series of his tweets.The conflicts between the two started back when Shekhar Suman’s son Adhayan Suman blamed ex-girlfriend Kangana Ranaut for torturing him and practicing black magic when they were in a relationship. He also accused her of being a drug addict. Kangana Ranaut who is known for her undaunted nature and who do not mince words is once again slammed on social media. Apart from her huge feud with Hrithik Roshan, she never failed to make a gibe about her Rangoon co-stars Shahid Kapoor and then Karan Johar very recently. Well among all the old rivalry, there is Shekhar Suman who bashed at Kangana Ranaut and blamed her for the Rangoon failure. Shekhar Suman, who is currently shooting for Bhoomi movie with Sanjay Dutt took to his twitter handle and tweeted bitter words not directly disclosing whom it referred to. Also Read: Kangana Ranaut Admits Being In A Relationship And To Get Married This Year! No name mentioned, but we are enough smart to connect the incidence with Kangana Ranaut and Rangoon is her latest flop. I meant smone totally different but i guess guilty minds are forever conscious.plz don't jump to conclusions.i never named no one. The beauty of democracy is that Kings become paupers and Queens become beggars.And the man who was written off becomes the Emperor!!! Let’s wait and see how the Queen actress Kangana Ranaut will react to this!! Previous : Emma Stone to Andrew Garfield, Dev Patel, Here Are the Best Dressed Women and Men at Oscars 2017!